"Always may your waters flow to quench the land and seeds you've sown." 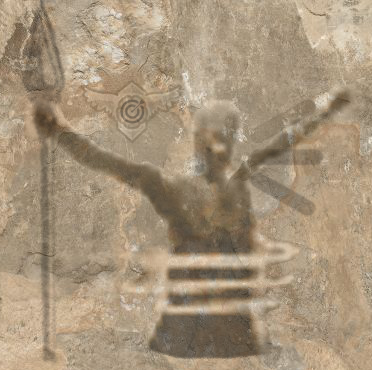 The Consulate of Vabbian, Istani & Kournan affairs (CVIK) is an organization dedicated to the preservation of Elonian history and culture within Kryta and Tyria at large. The Consulate, located in Ossan Quarter within a two-story, white building**with blue and gold accents and a thatched roof, is a community center open to everyone who takes an interest in Elona. With offices in Kryta, Ascalon and Lion’s Arch, CVIK aids in networking Elonians of various descent with groups or individuals through a variety of avenues such as: business enterprise, recreational, historical, martial and spiritual. **We occasionally utilize Minister Zamon's mansion to represent the Consulate's building in Ossan. From their main offices in Ossan Quarter, CVIK works with individuals and organizations to promote Elonian entrepreneurship, ensuring Elonian interests are represented in government, and aids in overseeing the general development and safety of Ossan Quarter. In the past, CVIK has assisted in the administration of refugee camps, and relocation of the residents of Lake Doric and the Elonian refugees who landed in Lion's Arch. With the Sea of Elon culled of any remaining undead threats, and the popular rise in available airships, now is the opportune time for CVIK to extend a hand to our friends and kinsmen in the Crystal Desert. As we have offered respite to the seeds and blooms of Elona in Kryta, we wish to nurture the very roots from which they sprang. CVIK is a community center with its main offices and programs located in Ossan Quarter, Divinity's Reach. The community center is open to all races to visit. Any human of Elonian descent, identifies as Elonian, or resides in Ossan Quarter can claim membership. With the discovery of Atholma Village on Sandswept Isles, the Olmakhan may also claim full membership of CVIK. Members who wish to take a more active role can work within one or more of the above categories. Everyone else who are interested in Elonian culture and history can join as an Ally. CVIK is an IC & OOC networking guild for both main and alt. characters. As a networking guild, there is NO application or interview process unless you want to take on a more prominent role within the guild as mentioned in the ROLES section above. OOC the guild is lead by colanah.2039 & emmadine.7246. From seven bells in the evening onward, celebrate Wintersday in the Ossan Quarter with an educational animal exhibit and enter your pet into the tricks competition to demonstrate that special bond you share with your beloved pet. Enjoy the relaxing atmosphere of the beach within the city walls: potted palm and date trees decorated with festive lighting strung around their trunks, canvas umbrellas, plush cushions, and music from the Land of the Golden Sun. In December, CVIK hosted a Wintersday event in Ossan Quarter entitled Warm Hearts, Warm Paws. A charity event inspired by the deeds of famed Elonian animal tamers: Nehdukah and Dzawan. The event included a pet trick competition and a hyena exhibit. We also gathered for our monthly meet and greet in Lion's Arch to discuss Elonian concerns across Tyria. In January 2016, CVIK will expand its influence in finance and politics within Kryta. Also, the beginning of the new year will see the Elonians travel to the Silverwastes to mysterious ruins. On the 14th of Zephyr, the Elonians traveled to the Silverwastes tasked with unlocking a mysterious structure built into the mountain side; a building surrounded by columns engraved with illegible Elonian script. The day started with meeting at Camp Resolve and locating the pack dolyak supplied by the Consulate. After taking note of the items of excavation tools and a map, the expedition team (with dolyak in toe) set forth to the eastern regions of the Silverwastes. It was a long and treacherous climb up the mountainside but once at the top, the Elonians were rewarded with a fantastic view and a set of ruins with a basic excavation site already prepared. There was a lot of information to take in. A crumbled set of columns with scorched marks on the stonework, the ground and nearby wall. A black triangle cut into the wall engraved with a curious symbol of a circle made of arrows. Finally, the tile the dolyak uncovered in its never ending quest for food. Unfortunately, evening set upon the area. With the desert temperature rapidly declining, the group hastily made their way back to Camp Resolve. They would return in a fortnight better prepared for the task at hand. 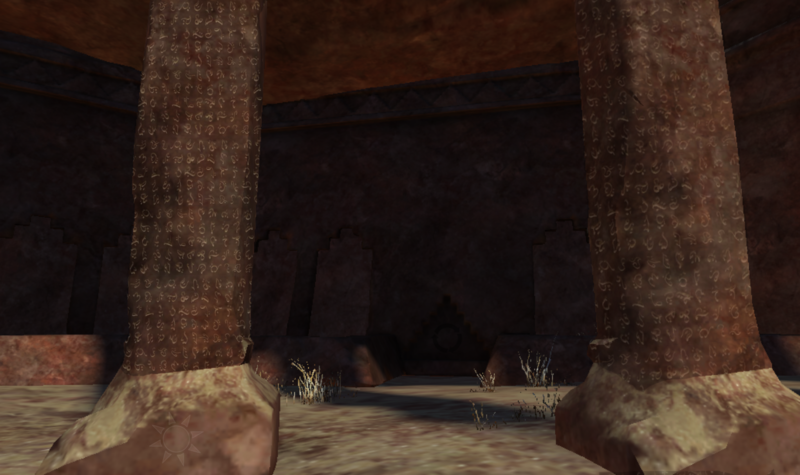 On the 28th of Zephyr, the Elonians returned to the Silverwastes to continue their task with unlocking a mysterious structure built into the mountain side; a building surrounded by columns engraved with illegible Elonian script. Once again, the day started with meeting at Camp Resolve. The climb up the mountainside was easier the second-time around. At the top, the group immediately continued their work from the previous fortnight. The excavation unearthed ceramic pressure plates with unique symbols. Many of these symbols referenced long forgotten knowledge from the Land of the Golden Sun. Yet, fortunately, one tile was solved. The mesmer in the group channeled her magic through the use of the mantra of resolve. The words: "Unbroken. Unshaken. Resolve" were chanted causing the ancient magic surrounding the building to reawaken. One of the doors, engraved into the stone building, opened to reveal a darkened tunnel devoid of light. It was then decided to wait before the Elonians continued to venture into the unknown. On the 42nd of Zephyr, the Elonians returned to the Silverwastes to venture into the unknown. However, before they continued into the darkness of the ruins, they attempted to decipher the hieroglyphics engraved on the remaining ceramic pressure plates. 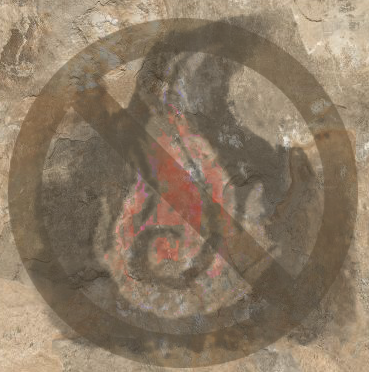 The first tile, which was found in an area covered in rubble and scorched marks, is believed to mean "do not use fire." 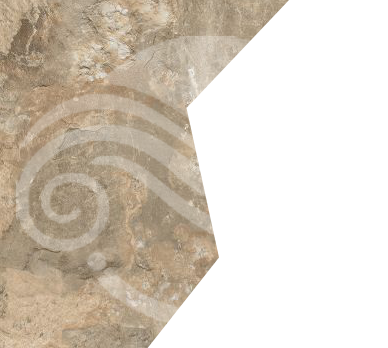 Tile 2 & Tile 3 are connected to form a pressure plate that utilizes the wind powers of the ancient Dervish. The final tile, found next to a spear, was determined to be related to the proud Paragons. Yet, the specific phrasing required to activate the building continued to elude the group. Once inside the building, by way of the mesmer pressure plate, the group made their way into a vast chamber guarded by a mysterious entity bathed in flame. With a bellowing voice and balls of fire, it chased our adventurers back outside; the building sealing back up. What is this creature of flame protecting? Why are there multiple pressure plates? 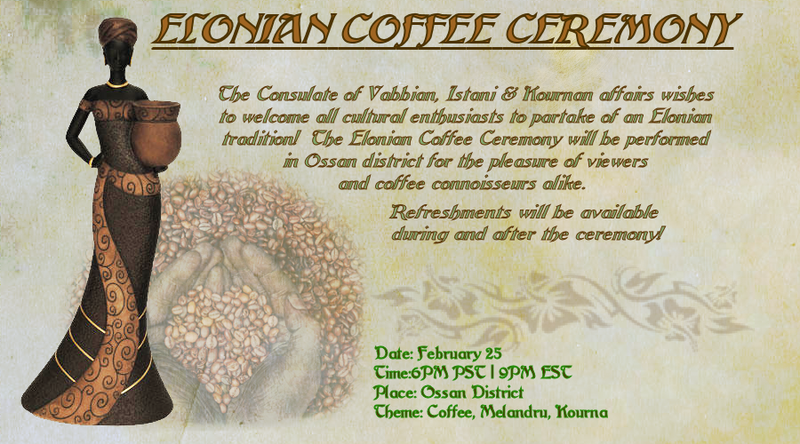 The Consulate of Vabbia, Istani & Kournan affairs wishes to welcome all cultural enthusiasts to partake of an Elonian tradition! The Elonian Coffee Ceremony will be performed in Ossan district for the pleasure of viewers and coffee connoisseurs alike. Refreshments will be available during and after the ceremony! On the 49th of Zephyr, the Elonians were hesitant to travel inside the ruined building to confront the fiery djinn directly. It was concluded they should, at the very least, scout the area inside for clues on defeating the ancient creature. 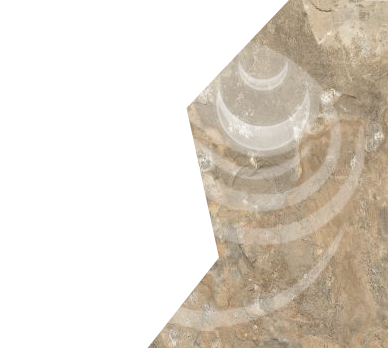 The group entered the ruins through the mesmer pressure plate without incident. 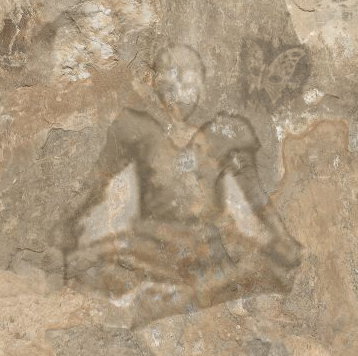 They continued through the darken tunnel towards the entrance of the djinn's chamber; the sandstone walls engraved with petroglyphs of Elonian flora and fauna, most noticeably were depictions of the hyena. According to Elonian legends, "the hyenas witnessed Abaddon's fall before the Exodus of the Gods, and they they still laugh at the fallen god in modern times." As one of the group entered into the main chamber, the djinn greeted him with rage and fury. Still, the lone Elonian persisted and stood his ground. As he introduced himself, informing the djinn of his ancestry to the Land of the Golden Sun, the creature was interested in learning more. Instead of spitting fireballs, the djinn listened and answered their questions on the building and its former residence: they had died by "four-legged creatures of moss and the Crescent moon of bones." The first description eluded the group but it was determined the second referred to Palawa Joko's Mordant Crescent. However it was soon clear from the djinn's actions and words that it had been corrupted by unknown forces. It asked for their help before turning on the group and chasing them from the chamber. The group left with many more questions than answers and decisions to make. What actually happened to the building's former residents? Who or what is controlling the djinn? Would the Elonians free the djinn from its psychological shackles or destroy the creature? On the 62nd day of Zephyr, after the monthly Elonian meeting in Lion's Arch, those gathered walked to the mystical forge and home to Zommoros the djinn. With the assurance of funds paid, the group was permitted to ask Zommoros only question each in a limited set time. The djinn communicated through his long-time assistant Miyani. “Across Tyria are holes in the fabric of the Mists. The Mists touch all, even demons.